Live, Golf, Stay at Bear Mountains beautiful resort community! 2 BEDROOM 2 BATHROOM – Loft condo located on Bear Mountain's 18th fairway offers a quiet and cozy stay. This condo which feels more like a home with its 20 foot ceilings and 2 floors offers beautiful views overlooking the Bear Mountain golf course and Mt. Finlayson. An easy short walk to golf, gym, hiking and restaurants, this bright and spacious south facing 1385 sq/ft loft unit has a bedroom and bathroom on each floor and offers everything you need for a comfortable and serene stay. Includes utilities, wireless internet, flat screen TV with cable, fully equipped kitchen with stainless steel appliances/gas stove, dishwasher, in-suite washer and dryer, one parking space in secured covered garage. A short drive to Thetis Lake, Florence Lake and Galloping Goose trail. A short walk to Mt. Finlayson/Goldstream Provincial Park and Bear Mountain's Westin and Golf Pro Shop. It’s also approx 20-25 minutes from downtown Victoria and UVic. -Bathroom #1: located on main level off of master suite. 4 pcs including claw foot tub & separate shower. -Bathroom #2: located on loft level. Includes 3 pc bathroom with shower. *Twist Hair Salon Twist is a full-service hair salon and aesthetic spa, offering hair designs and styles, beauty services and nail services in a unique, relaxing and elegant atmosphere. *Mountain Market is the place to go for your daily cup of Joe , delicious homemade soup, sandwich, goodies and basic groceries. It's located in the heart of the village and 10 minute walk from the condo. *Jack's Place/Kuma Sushi is situated at the second green of the Nicklaus co-designed Mountain course. Offering great pub style food and fantastic sushi. Energy is always flowing with their friendly staff, the live music on weekends and a beach volleyball or pool game happening in the background. * North Langford Rec. Centre (formally knows as Mountainside Athletic Club/ MAC) offers a variety of health and wellness opportunities for all levels of fitness. Enjoy a group fitness class, boot camp or just relax poolside by the outdoor heated pool and summer time pool bar, Oasis. * Bella is located in the Westin Building offers house West Coast fare, house-made pasta and fresh local favourites. * Masters Lounge with it’s relaxed ambiance is perfect spot for a handcrafted night cap and appy. Either inside by the fireplace in the winter or the around the fire-pits on the expansive patio. Being part of the Bear Mountain Resort lifestyle I thoroughly enjoy the lifestyle it has to offer. Whether it's golfing, hiking or meeting friends at the local establishments such as Jacks Place, Mountain Market and the Westin there is always plenty to do to embrace my social lifestyle as well as the serenity to welcome those quiet days. Bathroom 1: Claw foot tub with separate shower, granite counter, blow dryer, towel warmer with a door to the master bedroom or to the main living area. Bathroom 2: Three pc bathroom with shower, sink and toilet. Located and looking over the 18th fairway of Bear Mountains 'Mountain' course. Mountainside Athletic Club is a 5 minute walk away. Drop-in, Memberships and punch cards available for purchase at the club. Great south facing patio with gorgeous view of golf course, Mt. Finlayson and plenty of nature. Outdoor living room feeling with sectional couch, chairs, Adirondack chairs and electric heater. A lovely condo with a great view. Lots of room for 2-4 people. Great location. My husband and I enjoyed our stay at Bear Mountain. Amanda's condo was well-decorated and very comfortable. I particularly enjoyed watching the deer that passed by every evening. It was a very peaceful visit. Amanda herself is a delight. We cannot speak highly enough of our experience here. 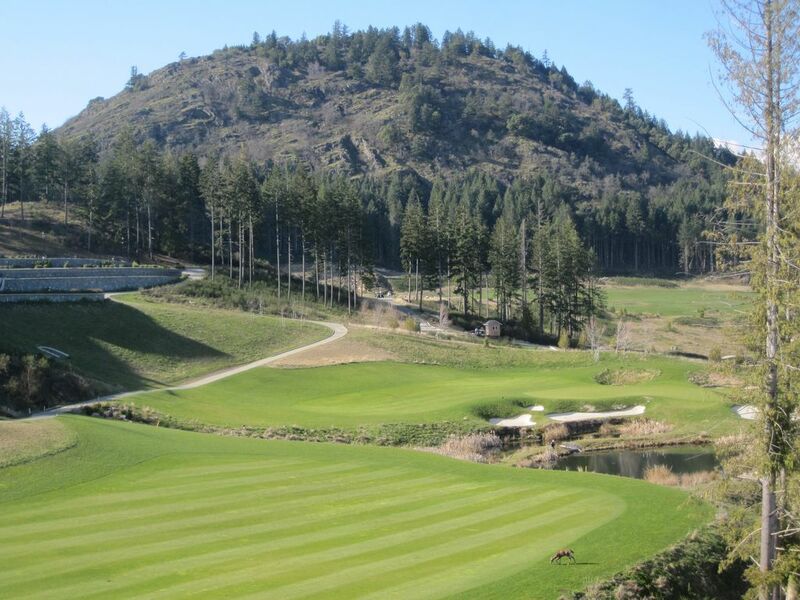 The location is perfect for easy access to the Bear Mountain Golf Courses and Restaurants. The Condo is in a great location in the building with very little noise from the neighbors. We did have a television issue but Amanda was very easy to get a hold of and was prompt about working on our concerns. We enjoyed our stay on Bear Mountain sitting out on the deck we watched a wedding take place above at the Westin. Was really great to be able to invite family over for a BBQ and a walk on Bear mountain. We really liked that Amanda had her own suggestions of things to do, places to see and shopping on the app. Thanks to her suggestions we spent a whole day on the Juan De Fuca trail strolling China Beach and exploring Botanical Beach. Was a superb day! So nice to come back to the condo soak in the tub and enjoy a glass of wine out on the deck! My family and I loved our stay! The place was beautiful, well kept, and the view off the balcony was just gorgeous. Everything exceeded our expectations, including Amanda's warm and friendly welcome. We'd definitely recommend and would stay again. 'There is plenty of family activities here on Bear Mountain such as the Mountainside Athletic Club that has an outdoor pool, hot tub and gym. Other things to do are golfing, hiking trails, restaurants (ie, Jacks Place that offers beach volleyball and great pub style food as well as sushi- all ages welcome). Off the mountain (5 mins down the hill- right at the foot of Bear mountain) there is All Fun Park which offers go karting, batting cages etc. Then about 10 mins away is City Centre Park that has bowling, kids splash water park, outdoor mini golf and an indoor play zone for kids. Another idea for the little more adventures type is Wild Play located 15 mins away. Also located just over the Malahat Hwy (North bound on the Trans Canada #1) are an array of local wineries and cideries. Search 'Wine Cowichan'. Whatever your fancy may be there is plenty to take in while staying at Serenity at Stonehaven!